Is your smile not complete? Tooth loss can negatively affect more than your oral health over time – it can lead to damaged self-confidence, a weaker bite, and even a lesser quality of life. At Covina Family Dental, Dr. Tran wants to help patients regain strong, reliable teeth as soon as possible, and dental implants are the best method in today’s world for accomplishing this goal seamlessly. If you’d like to explore implants in further detail, keep reading below or contact us today in Covina, CA for an initial consultation. Your natural tooth has two distinct and important parts. Everyone knows the white crown, which is what you see in a person’s smile, but there’s something else hidden beneath the jawbone: the root. A tooth’s root anchors it in position and stimulates the tissue around it. More traditional tooth replacement services like dentures and bridges don’t bother with recreating the root because it doesn’t contribute to aesthetics, but without it, the jawbone will deteriorate over time, and the patient’s overall oral health will suffer as well. Dental implants are so successful because they stand alone in recreating the tooth’s entire natural structure. The implant itself works as the tooth’s new “root,” which is surgically inserted into the jawbone. Dr. Tran can then create the ideal restoration (such as a crown, bridge, or denture) to attach over the placed implant(s) and recreate the tooth’s original crown(s). The results will be incredibly lifelike from every angle and built to last for decades at a time or even the rest of the patient’s life. A new crown will be recommended if the patient has one or very few missing teeth/implants that require restoration. The crown will be crafted from high-quality porcelain materials for natural aesthetics, and its placement will not threaten the health of surrounding teeth. If you are missing multiple teeth in a row, pairing two implants with a custom-made dental bridge may be the most effective reconstructive method. The implants will be placed on either side of the gap as “anchors” that hold your new bridge sturdily in place. For multiple lost teeth spread across your smile, an implant-retained partial denture may offer a better option. The denture uses a custom base to support numerous replacement teeth. It is crafted to fit between remaining teeth, and two to four implant posts are strategically positioned to support the partial. Implant-retained dentures are a cost-effective way to replenish several teeth at once. Dr. Tran will be able to connect the prosthetic to a small number of placed implants, and it can be fixed (permanent) or removable in nature, depending on the patient’s preferences. All-on-4 implants, like the name implies, are dentures designed to attach over just four strategically placed implants, recreating an entire arch of teeth at once. The unique positioning of the dental implants means more patients than ever before are able to receive an implant supported denture without the need for advanced and invasive preparatory procedures. The cost of your dental implant supported tooth replacement plan will depend in large part on the number of missing teeth and their location within your smile. During a dental implant consultation appointment, we’ll review your case, including treatment options and the costs associated with each. We do our best to keep the costs of your restoration plan within your budget, and we’re happy to work with third party financiers to offer low interest financing options. While dental implants and their placement aren’t usually covered by insurance policies, the other aspects of your treatment plan, including replacement teeth and preparatory treatments. We can help you plan for the cost of every stage of dental implant tooth replacement, so you can maintain a healthy, beautiful smile for life. 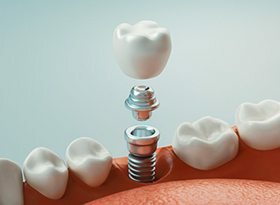 Dental implants combine the most advanced dental materials, the latest surgical techniques, and even your body’s own natural ability to heal to create this state-of-the-art tooth replacement. But how does this all actually work? What is the process like to get dental implants? How long does it take? How many appointments will you need to attend? You can find the answers to these basic questions and more by clicking on the link below.